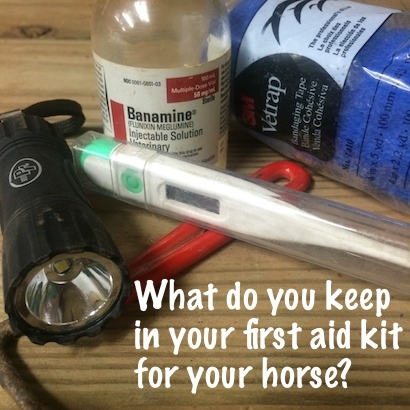 What's in your first aid kit for your horse? If you have had horses for longer than a week you probably have some kind of a first aid kit. It might be as simple as some ointment you picked up while you were buying feed or it could be enough equipment to rival an equine medical clinic. It is also likely that the longer you have had horses the more items you have accumulated. My items start with the basics. An ointment for minor cuts or scrapes (I have Novalsan), another ointment to keep flies away from cuts and scrapes (SWAT) and vet wrap if that cut or scrape is somewhere that it can, or should, be wrapped up. Vet wrap, or other self sticking wrap, will deteriorate in the unopened package so be sure to replace it if you have had it sitting around for awhile. It is incredible frustrating when you need it, have it, but then find out it won’t work. Scissors are a must have also. My husband carries all his shoeing supplies so I also have a variety of larger cutting tools available at my horse trailer for bigger jobs. A thermometer is a great diagnostic tool and your vet will be happy if you have already done your homework. Practice taking your horses temperature now…it is no fun to be training a sick horse while you are stressed. I keep a digital thermometer around because they are unbreakable but I dislike that the batteries die especially in the cold weather. At my house thermometers have a cycle: 1)grocery store 2)medicine cabinet for humans 3)barn for horses. Once they go to the barn…there is NO COMING BACK! Then I buy another one at the grocery store. I could save myself this hassle if I would buy another mercury thermometer, but I had one break in the house (it was still in stage 2 of the life cycle) and I learned that cleaning up mercury is a nightmare. When we packed up to begin traveling I made sure that we had Banamine on board. It is only available from your vet and comes in both an oral paste or a liquid. Obviously you will need to talk to your vet about this one. It is an items that I always travel with because it is the first thing that a vet will give a horse if they suspect colic. Having it on hand makes it easier when I call the vet because, if they want me to give some Banamine and watch the horse before they make a house call, I have it ready to go. These are five of the items that made it into my first aid kit. What are the minimum items you would recommend to a new horse owner? What items would be in your ultimate first aid kit? ← "Stacy-After an accident I have lost my confidence, what do you suggest?" I wish I could name only 5 – my kit is much bigger! Maxi pad make fantastic absorbent pads…LOVE sending my manly man husband to the grocery for those!!!! Vetricyn, 3M wraps, tape & Vetwrap, scissors and flashlight! I had never thought of the Banamine. That’s a great idea. Also, going to have to put a thermometer in there. Thanks! Did you find somewhere to buy Nolvasan? I thought they quit making it. It is by far my favorite ointment to use! Bute, flashlight with extra batteries, twitch, hand sanitizer, kopertox, hoof pick, alcohol pads, syringes and needles, crazy glue, sterile saline solution, providone iodine solution, permanent marker, notepad, snake bite kit, whistle, bottled water. Put everything in a red backpack so you can take it along when you’re away from the barn. Good call on the Previcox Debra. I always have it in there, but I’d forgotten to put it on the list. Great for older horses for maintenance. We have had super results with it. Bute, banamine, mercury thermometer with folded over duct tape on the end so it’s easier to find on the floor of the stall :), Omeprazole (Which I think is a must have for a million reasons-research incidence of ulcer activity of travelling/showing horses) and also to give as a follow up to Banamine at the first sign of colic, disposable diaper and leg wrap, sugar and iodine to make a poultice for a foot abscess …that’s a start!